I think we chose the simple back of the can recipe and even though we made pumpkin pie together before, a moment of confusion must have set in. When we sat down for dessert, one after the other of us bit into a clove! She’d used whole cloves instead of ground. Well, she’s never quite lived that down, but over the years survived, mostly with good grace! So this isn’t that standard Libby’s Pumpkin Pie that I grew up with and that Jess made that day – which is delicious (usually, lol) but always had a few things about it that kind divided people into two camps: those who love pumpkin pie and those who don’t care for it. And if you’re in the second camp, you know what I’m talking about. It seems to be a “texture” thing. There are some people that just don’t like that shiny, cold wet texture. Pam Anderson’s Silky Pumpkin Pie takes your standard Pumpkin Pie and elevates it into a masterpiece and solves every issue pumpkin pie can have. And while this recipe for Pam Anderson’s Silky Pumpkin Pie is a bit more work than your standard Pumpkin Pie, it’s a pie with a gorgeous flavor, not over spiced, and it lets the pumpkin flavor shine through. Mostly, though, Pam Anderson’s Silky Pumpkin Pie has a beautiful, almost fluffy custard and a method that ensures the crust that stands up to the silky filling and is perfectly flaky throughout. And Pam Anderson is not that Pam Anderson; Pam Anderson has a long culinary history and is the author of “The Perfect Recipe” along with several other books, a former editor of Cook’s Illustrated, a contributing editor to Fine Cooking and a columnist for USA Weekend. So you know Pam Anderson’s Silky Pumpkin Pie is going to be great! Btw, floating around on the net are a few versions of this pie that aren’t quite right. This is the original recipe from her book. While I’ve never made the mistake my daughter did, over my many years of pumpkin pie making I’ve fallen into one pie pitfall or another, many times. You won’t with this pie. The recipe works perfectly every time and is going to give you a pie that people are going to sit up and take notice of. And I’ve made this pie enough times that I’m going to lay out some helpful hints and advice, too, and those work for almost any Pumpkin Pie you’re making. If you’ve never prebaked or “blind baked” a pie crust, it just means to bake the crust first which avoids a gummy, slick bottom crust. I have a post on how to Blind Bake A Pie Crust. Btw, if you’re wondering about the lighter than the usual color of my pie, the Pam Anderson’s Silky Pumpkin Pie is a little lighter in color than some pies because of the spices used, but my pie was made with Homemade Pumpkin Puree, too. Pumpkin Pies made with a homemade pumpkin puree are generally lighter in color than those made with canned filling. This recipe calls for a prebaked (Blind Baked) Pie Crust. The timing is critical to success so time your crust and pie filling to be ready at the same time. Make sure to pour the warm filling into the warm crust, working quickly so that the oven is still warm when filled pie is added. If your filling or the pie crust is not hot enough the pie will take much longer to cook. Work quickly when filling the pie. If the oven temperature reduces too much from 425 towards 300 when the pie is added, this may take significantly longer to cook. Instead of measuring out spices and salt, I sometimes use a scant 2 1/2 teaspoons of my pumpkin pie spice. This makes a darker pie with a more “Libby’s” type flavor. I generally bake this in a standard Pyrex deep dish pie plate and take care to not build up the crust above the top; if using a standard old-fashioned pie plate, it’s a tight fit. Then I build the crust up over the top; there may still be some leftover custard. If you’re not using a deep dish there may be a little left over filling – it can be baked in small custard cups along with the pie. They’ll be done much more quickly; you’ll just have to check them frequently. 20 to 30 minutes? Have a “pie shield” on hand and place it over the crust at about 17 minutes. If you don’t have one, make one out of aluminum foil, before you bake the pie. When you realize your crust is browning too fast is not the best time to be improvising a pie shield or trying to lay strips of foil over the crust. Instructions are in my post on Blind Bake a Pie Crust. You can get an idea of when to test with your knife and avoid multiple “puncture wounds” by giving the pie a “jiggle.” There should only be a very faint movement in the very center of the pie while the rest appears quite firm. It will continue to cook after it’s removed from the oven. For best results, cool the pie on the counter on a rack to room temperature, then put in the refrigerator uncovered until it reaches refrigerator temperature. Then cover. This reduces the chance cracks, pulling or condensation will form, marring the perfect surface. Do see my post on how to Blind Bake A Pie Crust for lots of helpful info! Now is the best time of year, through New Years, to start watching for specials (and lots of coupons if you use them) for just about any baking items. Figure out what you need and pick up enough to last through Easter. Just about every baking item you can think of will be very competitively priced. See my post on what to buy during the Winter Holidays. This is when you want to pick up (or make) your pumpkin puree, canned pumpkin. My sister-in-law mentioned once that canned pumpkin is best in pies after it’s been “aged” for a year. I swear I think it’s true! I stock up during the fall, and make sure I have a couple cans stashed away for next year’s pie. It’s great to have on hand if you like to make savory dishes all winter long, like pumpkin soup. I always watch the egg prices during the holiday sales and stock up. If they’re on sale around Halloween, I buy enough to last to Thanksgiving, then at Thanksgiving, I buy enough to last to Christmas, and so on. Eggs last for weeks past the “buy by” date, and for some items, like hard boiled eggs or deviled eggs, it’s nice to have eggs that have a bit of age on them. I don’t eat eggs every day for breakfast, and if you do, you might not have enough storage for this strategy! You’re going to have two egg whites leftover when you make Pam Anderson’s Silky Pumpkin Pie. They can be frozen, and if you want some ideas on how to use them, see my post on Over 75 ways to use Leftover Egg Whites. While the pie shell is baking, in a saucepan, heat pumpkin, salt and spices to blend flavors, about 5 minutes, stirring often. Add the two different milks and whisk to combine and heat through. Whisk the eggs and yolks together in a medium bowl to blend, then whisk in the pumpkin mixture, a tablespoon or so at a time at first to gently warm the eggs. After a few tablespoons, continuing to whisk, add the rest of the pumpkin mixture. As soon as crust is done, pour warm filling into still warm, just from the oven, shell. Bake until a thin-bladed knife inserted about halfway from the center comes out clean, about 45 to 55 minutes. Remove from oven and let cool on a wire rack to room temperature. Refrigerate and after cool cover carefully with foil. This recipe calls for a prebaked pie shell. I prefer my own pie crust, of course but use any crust you like, even frozen. Just be sure it’s baked by the time you have the filling prepared. Don’t let an insipid dessert ruin your feast. Your guests will gush over this dense, intense pie. 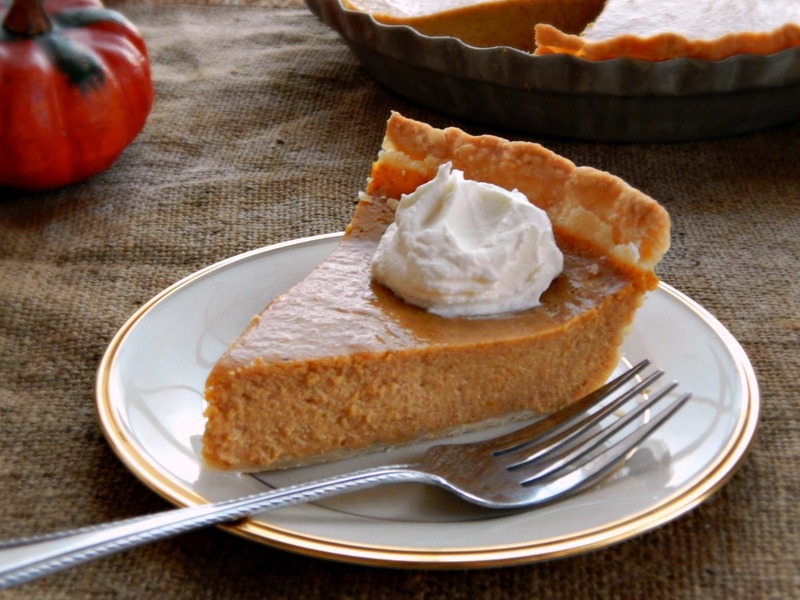 I will be sharing Pam Anderson’s Silky Pumpkin Pie at our very own Throwback Thursday and Fiesta Friday. Our Fiesta Friday co-hosts this week are Antonia @ Zoale and Petra @ Food Eat Love. This entry was posted in Click here for Fabulous Food Posts and tagged condensed milk, Desserts, evaporated milk, Pam Anderson, Pamela Anderson, Pie, Pumpkin, Pumpkin Pie. Bookmark the permalink. it’s going to take a few minutes —right ? I really appreciate any help and advise you can give me. Thanks, I really am looking forward to trying this yummy pie ! Abbey, I’m glad you caught that – pie crust is baked at 425F and since I called for a prebaked crust, with a different link on blind baking the crust, I didn’t note the temp. You’re absolutely right, it wasn’t clear at all. Hope I didn’t mess you (or anyone else) up! Great story! for years we didn’t find ground cloves here, so we used to just pop five or 6 on the top of the pie and then pick them out when it was cooked….. This sounds amazing. We use the Libby’s recipe ourselves but add nutmeg and all spice. It definitely makes it richer and tastier. Hope you had a lovely Christmas and New Years! Whoa– that sounds like a memorable Thanksgiving– sorry you had to spend it shouting instructions from your bed! I agree that pumpkin dishes shouldn’t be overspiced! Often you just taste the cinnamon and the delicate pumpkin flavor is lost. This looks beautiful! Hope you have a delicious Thanksgiving with your family/friends –and no accidents along the way! Thanksgiving hugs friend! The important thing was we were all together – and had pie!! 🙂 I was (and am) so proud of her! I do have a new pumpkin pie extravaganza coming up! Cross your fingers it turns out to be as good as it looks so I can post it! Mmmm, it’s pumpkin pie season! Yours looks wonderful. Too funny about your daughter… I bet that helped make that Thanksgiving the most memorable one ever. I will say this – we did eat all the pie – just more cautiously, lol! Thanks, Loretta, and happy Thanksgiving to you, too. It’s just approaching so quickly my head is spinning! I’m already making two different pies for turkey day, but will keep this in mind when my fam wants some pumpkin pie. I have a silicon pie shield I use, which I won in a cooking contest. I probably would have never bought one on my own since I used a foil shield prior. Oh, and you’re making pie!! 🙂 That slipped by me for a quick minute, lol!! haha!! Well I can’t wait to see Texas Pecan Pie! We saw a beer today from Rogue Brewery from Oregon today – It had Sriracha in it and was in a big bottle the color of Sriracha – I wondered if it was from your fave brewery out there? That is my fave brewery at the coast where we have RV property! They make an excellent beer cheese soup too. It’s hard to pick one in Central Oregon where I live, as we have 29 breweries, LOL! Oh my yum! This looks absolutely perfect! Thanks Mack, it really is a beautiful pie. Silky gorgeous texture and it’s never wet and slimy like some pies. We love it. I feel for your poor daughter. Lovely pie photos too Frau. I remember the first time I baked cookies (3rd grade) my friend Ruth and I used Baking Soda instead of Baking Powder – the cookies tasted HOT! Everyone ate them, though! Which goes to show, a bad cookie is better than no cookie! Oh no she put in whole cloves, that must have been a surprise for all. I think the recipe sounds wonderful, never used sweetened condensed milk in pumpkin pie before and it sounds really good to me. Yes! Each bite of pie had it’s own burst of flavor! It still wasn’t too bad, though, and I think we ate it all! Funny thing is, it would be more “frugal” to make a standard pie! I can’t begrudge an extra buck or so for this – it’s really an excellent pie. Oh my gosh – your Apricot tart would be so good for Thanksgiving! I still haven’t tried it – but it pops into my head!